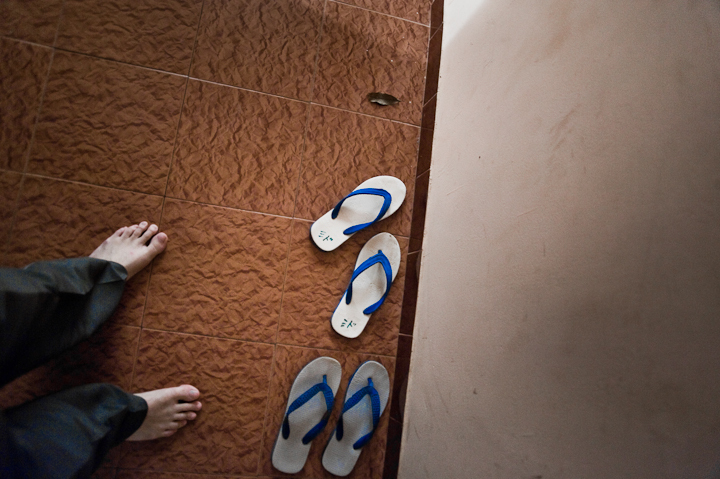 We must leave our shoes at the dorm entrance. “What is divinity? A: It’s on page 15.” — TTC guys in my dorm. I‘ve started getting used to the faces around me: There’s Mafidash (Corinne and I can’t remember his name) from Maine, who has a huge beard and gave me a book. There’s Chrissy from Toronto, who got into a rickshaw accident on her way here and has bandages all over her face. Then there’s Damian from the French Alps, who is my co-karma yogi at the boutique. And there’s Anna from Liverpool, who lives in London and works in marketing. No sign of Corinne yet this morning though — and I’m getting a little worried. My asana practice feels more graceful and assured — but where is Corinne? She’s sick; that’s what her dormmate told me during my karma yoga at the boutique. (I had tea with her and she seems better.) 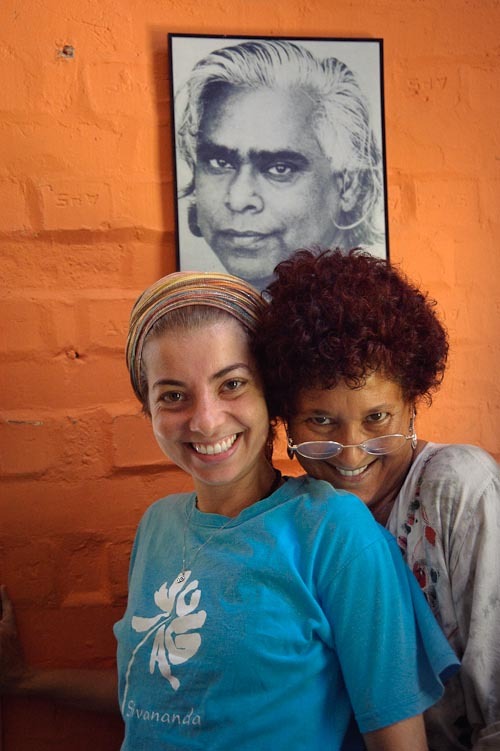 I took some photos of Ananda and her assistant Sita — and now we will do a project together photographing all the karma yogis doing chores like cleaning toilets and cutting vegetables. Sita and Ananda pose with Swami Vishnu-Devananda. Today I met a few new people: Richard (actor from London), Jane (teacher in Mumbai), Lily (traveler from Switzerland), and Tara (costume designer from Dublin/Toronto). I like everyone here, with maybe a few exceptions — but we’ll see. Night walk to the lake was fun. 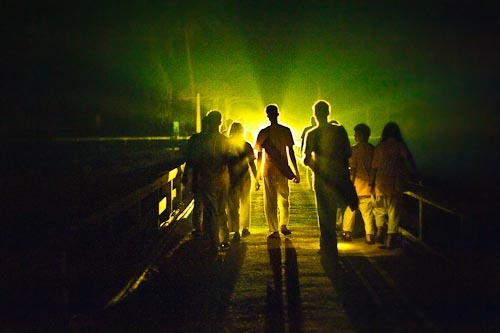 A motorbike briefly illuminates the pitch darkness on the bridge facing Neyyar Dam. I’ve added a Like button. Thanks for the suggestion! قال:يوجد خطأ أثناء تركيب القالب عزيزي .Warning: Cannot modify heeadr information heeadrs already sent by (output started at /home/spearfis/public_html/wp-content/themes/Karma/functions.php:246) in /home/&&&&&&/public_html/wp-includes/functions.php on line 851Warning: Cannot modify heeadr information heeadrs already sent by (output started at /home/spearfis/public_html/wp-content/themes/Karma/functions.php:246) in /home/&&&&&/public_html/wp-includes/functions.php on line 852ماهي طريقة تفعيل Go to Adminpanel > Appearance > Menus to create your menu. You should have WP 3.0+ version for custom menus to work. You could certainly see your enthusiasm within the paintings you write. The world hopes for more passionate writers such as you who aren’t afraid to say how they believe. All the time go after your heart. “The only way most people recognize their limits is by trespassing on them.” by Tom Morris..